Texas Senator Ted Cruz took some time out of his busy schedule of being generally hated by everyone on Saturday to defend conspiracy theorist and Infowars grifter Alex Jones against a temporary suspension on Facebook. 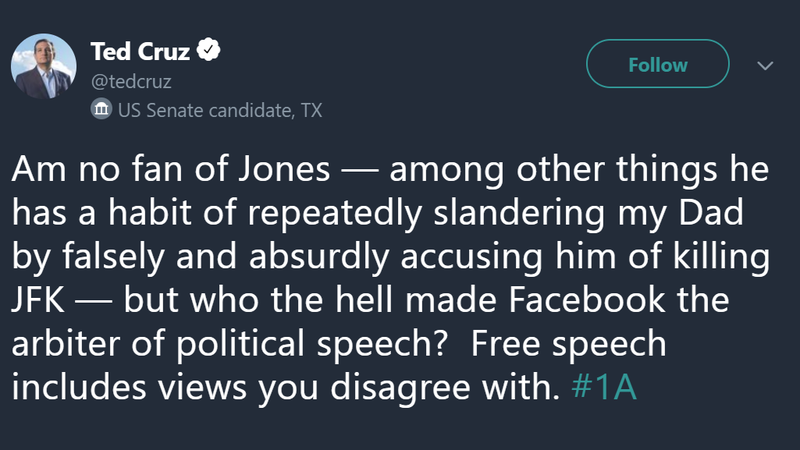 For once, Cruz struck a centrist position, albeit one between him and Infowars: He disapproves of what Jones says, but he will defend to the last bad tweet Jones’ right to defame mass shooting survivors and their families to hundreds of thousands of Facebook followers. In other words, there’s a war on for your mind! Saying Cruz’s dad shot John F. Kennedy is, however, extremely low on the list of bad things Jones and Infowars have done. Recently, that list includes promoting far-right personalities like white supremacist Faith Goldy, who endorsed “ethno-nationalism” on the anti-semitic Red Ice media network and does video reviews of fascist literature, as a candidate for mayor of Toronto. (Infowars ran a somewhat confused front-page spread on Friday calling her a “pro-Trump nationalist.”) More broadly, it’s included targeted harassment of mass shooting survivors and their relatives, the official reason for Jones’ temporary Facebook suspension and one of the many things Jones is currently facing lawsuits over. This is a pattern: Tech companies deeply want to avoid the headaches that come with riling up conservatives, but they also want to reassure users that they’re doing something about rampant trolling, misinformation and harassment. So they end up bungling it on both ends, and then the conservatives close ranks and yell about it anyhow. It’s a small miracle the president hasn’t weighed in on Jones yet as well. In any case, by amorphously framing the issue in terms of “free speech,” Cruz can ignore the context and content of said speech and further the ultimate conservative endgame: having no accountability for anything they say whatsoever. They don’t want Facebook to play fair so much as they want it to play by their rules and on their terms, and if making the Pizzagate pusher who thinks the Illuminati puts chemicals in the water to make “the friggin’ frogs gay” into a martyr helps, so be it. Gizmodo has reached out for comment to Cruz’s office, and we’ll update this article if we hear back.